After missing out on Singapore a decade ago, Wynn may not be able to expand in Japan either. Gaming companies Wynn Resorts (NASDAQ:WYNN), Las Vegas Sands (NYSE:LVS), Melco Crown (NASDAQ:MLCO), and MGM Resorts (NYSE:MGM) are all excited about the potential for Japan to open up its gaming market to megaresorts. Starting in late 2017, we could see bids for a limited number of gaming licenses, and nearly everyone has thrown out the idea of spending $10 billion to build in the potentially lucrative market. The last time we saw this kind of excitement was when the Singapore bid for a casino near downtown was awarded in 2006. But spending that kind of money is not a small matter, even for the gaming giants. And Wynn Resorts, in particular, may be betting big on other markets at the expense of gaming in Japan. But after missing out on Singapore over 10 years ago because of a high price tag and big projects in Las Vegas and Macau, the company could have another missed opportunity. Marina Bay Sands is the resort Steve Wynn wishes he had built. Image source: Las Vegas Sands. Looking at where Wynn, Las Vegas Sands, Melco Crown, and MGM stand financially can give us a picture of who has the capability of spending $10 billion in Japan. The chart below shows the debt-to-EBITDA ratio for each company. 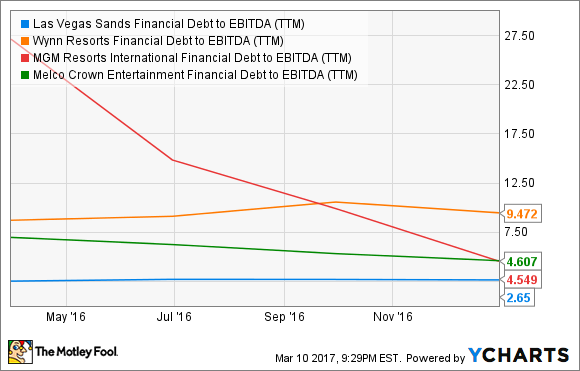 LVS Financial Debt to EBITDA (TTM) data by YCharts. To be fair, Wynn just opened Wynn Palace, so its ratio -- the highest in the group -- will come down. But the company is also spending on Wynn Boston Harbor, which won't open for at least two years, and has proposed building Wynn Paradise Park in Las Vegas. The leverage the company is carrying is clear, despite the fact that Steve Wynn has never been one to overextend his company in the name of growth. So Wynn may not even pursue Japan if it doesn't have the capital available. The chart below gives a little context to the different scale these gaming companies operate on, and provides a clue as to which one may be able to build a $10 billion resort. Las Vegas Sands could clearly finance a project that size without taking on too much extra leverage in the process. MGM could also probably finance a resort of that scale, although the project would leverage the company more than it would Las Vegas Sands. 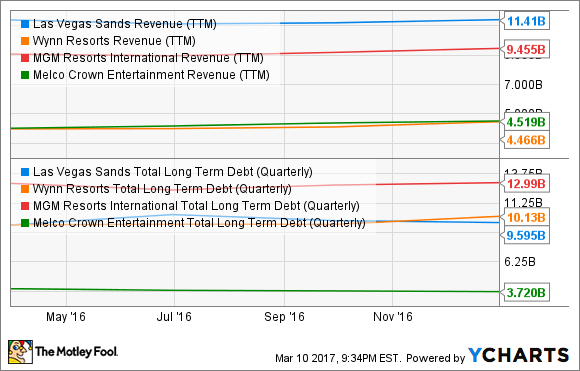 LVS Revenue (TTM) data by YCharts. Melco Crown is a wild card given its relatively low debt load but small size as a company. A $10 billion bet on Japan may be a make-or-break move for the company over the long term. None of this is to say there aren't other financing options available for any company that wins a bid in Japan. A local partner may come in, helping finance the project. We could also see an equity raise, which may not be as bad as it seems if Japan is as lucrative as hoped. What we'll have to watch is how much gaming companies are willing to spend to grow in places like Japan, and where they're spending besides or instead. In the case of Wynn Resorts, the company has so many projects underway that it may decide that building in Japan would stretch things too far. But if Japan turns out to be a repeat of the lost opportunity in Singapore, sitting this one out may be a move Steve Wynn and the company will eventually come to regret.